How much candy do people eat on Halloween? How many kids go trick-or-treating? What should be on your playlist for your Halloween party? 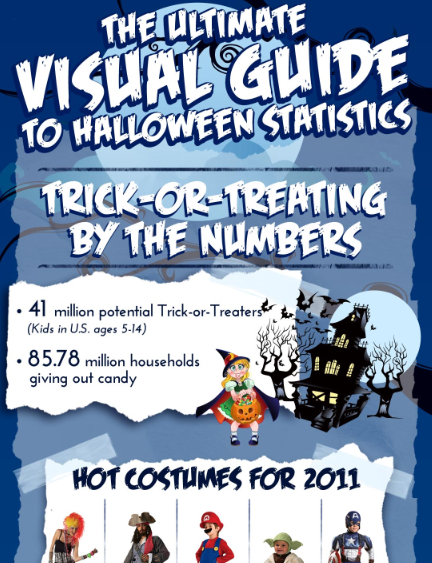 We put together The Ultimate Guide to Halloween Statistics Infographic to answer all these questions and more, including the best scary movies to watch, the history of trick-or-treating, and just what costume to pick for 2011. Read at your own risk! Click the image to view full infographic. <a href="/" href="/"><img src="https://images.halloweencostumes.com/blog/files/2011/10/infographic-final-lg.jpg" src="https://images.halloweencostumes.com/blog/files/2011/10/infographic-final-lg.jpg" alt="The Ultimate Visual Guide to Halloween Statistics" width="550" height="7621" style="border: none;" style="border: none;" /></a><br /> <<a href="/" _mce_href="/" href="/" _mce_href="/"><img src="https://images.halloweencostumes.com/blog/files/2011/10/infographic-final-lg.jpg" _mce_src="https://images.halloweencostumes.com/blog/files/2011/10/infographic-final-lg.jpg" src="https://images.halloweencostumes.com/blog/files/2011/10/infographic-final-lg.jpg" _mce_src="https://images.halloweencostumes.com/blog/files/2011/10/infographic-final-lg.jpg" alt="The Ultimate Visual Guide to Halloween Statistics" width="550" height="7621" style="border: none;" _mce_style="border: none;" style="border: none;" _mce_style="border: none;" /></a><br /> <a href="/blog/post/2011/10/13/the-ultimate-guide-to-halloween-statistics-infographic.aspx" _mce_href="/blog/post/2011/10/13/the-ultimate-guide-to-halloween-statistics-infographic.aspx">The Ultimate Visual Guide to Halloween Statistics</a> and <a href="http://www.halloweencostumes.com" _mce_href="http://www.halloweencostumes.com">Halloween costumes</a> Infographic Created by HalloweenCostumes.com.</a>. Q: How many kids go trick-or-treating? A: There are 41 million kids in the U.S. aged 5-14 that are potential trick-or-treaters. Q: How many homes are there to trick-or-treat? A: There are 85.78 million households that give out candy. Q: What are the hot costumes of 2011? A: Where’s Waldo, Pirates, Mario Brothers, Star Wars, Captain America, Wonder Woman, Angry Birds, Harry Potter, Smurfs, and Monster High. Q: How much do people spend on Halloween costumes? A: $1.21 billion is spent on adult costumes, $1 billion on kid’s costumes, and pet-owners spend $310 on costumes for their furry friends. Q: What are the best and worst places to trick-or-treat in the country? A: Plano, TX, is the safest city in the country, while St. Louis, MO, has the highest crime rate. City of Falls Church, VA, has the highest median household income. San Francisco was named the best city for walking. Minot, ND, was 26 degrees in Halloween 2010, one of the coldest towns in the country. Q: How much candy do people eat on Halloween? A: The average American eats 1.235 pounds of candy on Halloween, which is the equivalent of 33 Fun-Size Snickers, 56 Fun-Size Twix, 127 Starbursts, and 280 M&Ms. Q: How are people planning to celebrate Halloween? A: 34.3% of Americans plan to throw or attend a Halloween party. 73.5% of Americans plan to hand out candy to trick-or-treaters and 47.8% plan to carve a pumpkin. 32.9% will take their children trick-or-treating, 49.5% will decorate their home or yard, and 43.9% of Americans plan to dress in costume. Q: What are the most played Halloween songs? A: According to Billboard, the most played Halloween songs of 2010 were Thriller, Monster Mash, Ghostbusters, Werewolves of London, and Highway to Hell. Q: What are the most popular scary movies? A: In order, the highest grossing horror franchises of all time are Saw, Friday the 13th, A Nightmare on Elm Street, Scream, and Halloween. Q: What is the most popular Halloween TV special? A: It’s the Great Pumpkin, Charlie Brown, which will air for the 45th year in a row in 2011. Q: What are the most popular scary books? A:The Goosebumps series by R.L. Stine, Stephen King novels, and A Dark Matter by Peter Straub. Q: How big was the heaviest pumpkin? A: 1810 pounds, recorded in 2010. Q: What is the history of trick-or-treating? A: There is record of “guising” in Scotland in 1895, which is when children dressed in costumes and collected treats. In 1911, there was the first record of guising in North America in Ontario. Ruth Edna Kelly described a process like trick-or-treating in her book Hallowe’en in America in 1919. In 1927, there was the earliest recorded use of the term “trick or treat” in Alberta. And by 1939, the term “trick or treat” was printed in the national publication The American Home.